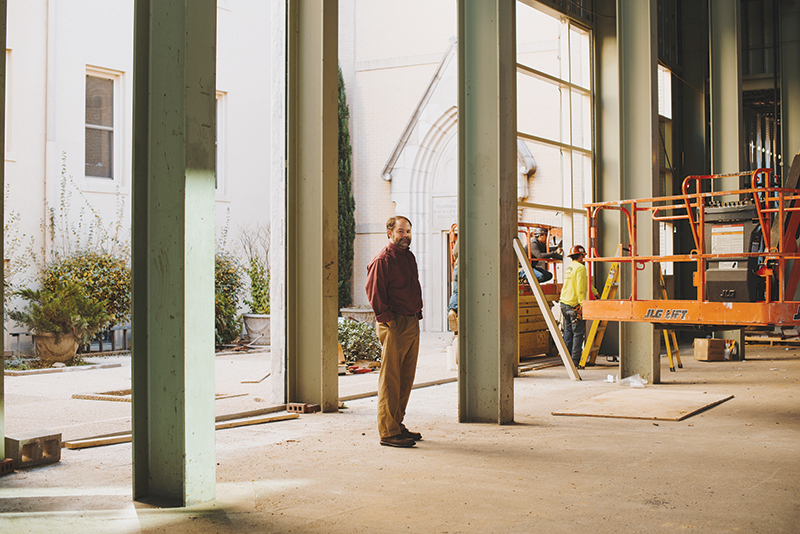 The steel framework for a new First United Methodist Church Downtown has stood for so long that when the new sanctuary is completed early next year some of the framework will be visible in the building’s interior. The circa-1890 granite church at the northwest corner of Second Street and Poplar Avenue was destroyed in an October 2006 fire. The ironwork went up around 2009 and has remained there ever since. First United Methodist members have worshipped at the church’s nearby Pepper Center building since repairing smoke and water damage to it in the immediate aftermath of the fire. 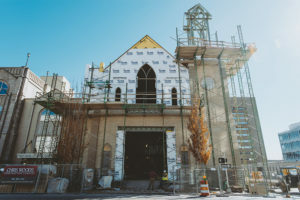 The congregation voted in January to move ahead with a $4.2 million restoration of the sanctuary, hired Chris Woods Construction as the general contractor, broke ground in April and is moving toward a tentative opening date in February. The original plan to build a new sanctuary surfaced soon after the fire, but so did the worst national economic downturn since the Great Depression. That made the ironwork a longer-term presence on the Downtown streetscape that also includes nearby First Presbyterian Church on the same block of Poplar and St. Mary’s Catholic Church, two blocks to the north. It’s also less expensive than trying to cover the structure. The catalyst to scale down and rework the original plans and begin construction was a gift of close to $1 million and then a separate bequest of close to $1 million, both in 2013. 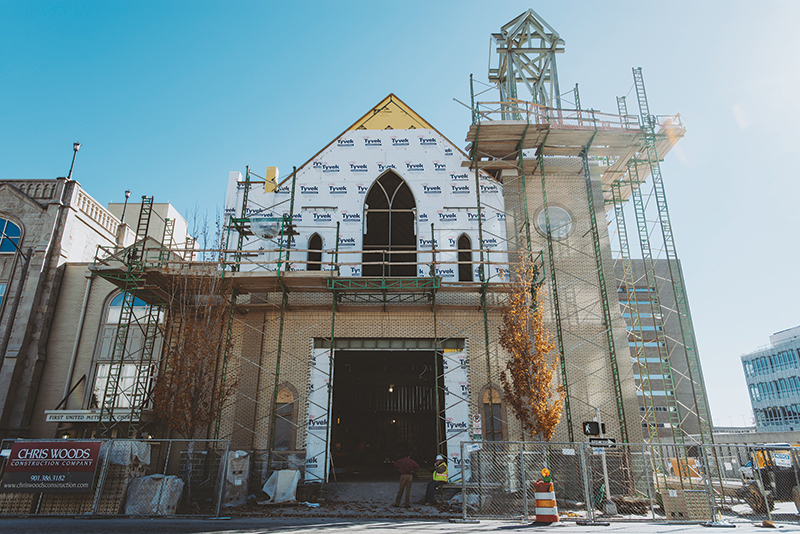 The church forming behind scaffolding is different than the blue-gray stone exterior that for 113 years was the home of the city’s first church, dating back to 1826. That’s when a Methodist circuit rider named Thomas Davidson and three others held the first worship service. The congregation bought land in 1832 and built the first sanctuary where the new church is being constructed. The 1890 church was built where that church stood. 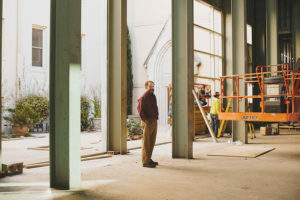 Half of the 1890 church’s stone double archway is on the concrete floor of the new sanctuary, awaiting fitting in the new church layout, and the new windows arrived just before Thanksgiving. A single piece steeple is due to arrive just before Christmas. The church site has been active in the 11 years since the fire, even after the ironwork went up and the reconstruction was put on hold. “Internally, we called it the slab. Externally it was the outdoor sanctuary,” Rambo said of the bare bones of what is now taking shape. Also in the interim, the church bought the Carpenter’s Union building that is on the other side of the Pepper Building and, with an alley closing approved by City Hall, that will house the homeless ministries that were a long-running feature of the church well before the 2006 fire.